Manchester United has donated floodlights to a non-league football club which came to its aid in the wake of the Munich air disaster. Bishop Auckland FC loaned three players to the champions following the 1958 crash which killed 23 people, including eight members of the Busby Babes. 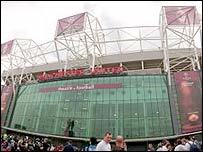 It has now been rewarded with the gift of 24 lamps from the football giant's famous Old Trafford stadium. The County Durham-based club hopes to use them at its proposed new ground. Tony Duffy, Bishop Auckland FC secretary and director, said: "This is a tremendous gesture and it just shows that despite all their success they have not forgotten the value of non-league football." At the time of the air disaster Bishop Auckland FC was one of the leading non-league teams in England, having just won the FA Amateur Cup three years in succession. It loaned its three England amateur internationals Warren Bradley, Bobby Hardisty and Derek Lewin to help manager Matt Busby rebuilt his decimated squad. Earlier this year, Manchester United placed an advert asking amateur clubs to write in and explain why they deserved the floodlights being replaced at Old Trafford. Four other non-league clubs have benefited.